Birding Corvo 2009: New species for Corvo! Hôla! Me and Jan Kåre just got back from the restaurant where we ate the fish dish Bacalau, which turned out to be exactly the same as Norwegian dry fish, a dish served in Norway according to Jan Kåre. It was rather dry and very salt, but still tasty! The birding day today began a bit different than usual. Since the oldest man on the island (96 years!) had died, Manuel had to go to his funeral this morning and couldn't act driver. Therefore I hitched up to the end of the middle road (via the nice drivers eight cows that we fed first). Down in the village the weather was pretty good with clouds hanging pretty low so Jan Kåre stayed down here. And when I got up on somewhat higher altitude it was REALLY foggy! It was so dense it was even raining a little - welcome to the Azores! If it had stayed that way it would have been ok, but when we reached the end of the road the skies opened and it rained. A lot! We sat in the car doing our best to have a conservation, me speaking English and he Portugese. But after half an hour my driver got enough and we drove back into the village, where it still was dry. So I decided to bird the village today instead, just like Jan Kåre. When I got down to the harbour I heard a distant, familiar call from the sky and soon found a godwit flying high up in the sky. Saw it good though and soon identified it as a Bar-tailed Godwit - a new species for Corvo! When I got up to the little lighthouse Jan Kåre joined me and we did a short seawatch together which resulted in two Great Shearwaters among all the Cory's, a lifer for Jan Kåre! 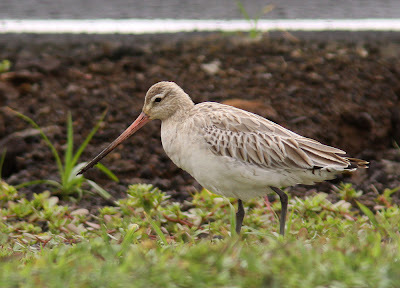 Continued to the airstrip where the Bar-tailed Godwit, an adult female, was walking around eating. When we had rounded the airstrip and got to the small beach I heard a distant Common/Spotted Sandpiper and soon saw the bird flying away. 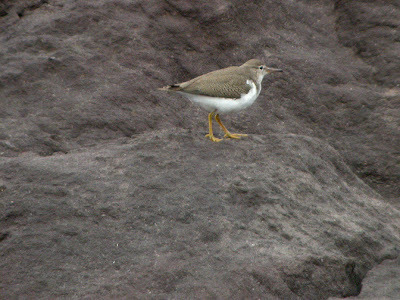 It landed on some lava rocks further away and when we got closer we saw it was a nice juvenile Spotted Sandpiper. The winds did bring something! 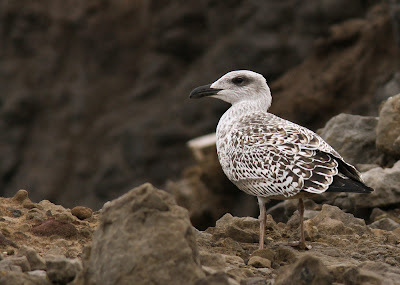 When we turned around after watching the Sandpiper a juvenile Great Black-backed Gull was standing behind us, a rather scarce bird on the Azores. The following six hours or so the birding was pretty quiet with a Goldfinch and an adult Lesser Black-backed Gull as highlights while I was checking fields, gardens, fig trees etc. I ended the day with an hours seawatching which gave another four Great Shearwaters among the Cory's gathering for the evening in big flocks offshore. Tomorrow the weather will hopefully be a bit better (it's clear outside now) so I can continue checking the valleys while Jan Kåre is on his day trip to Flores. Cheers!